Setting up a Front Chat inbox allows you to live chat with your customers directly from Front so that all your customer interactions occur in one place. Front Chat will work for any website, Electron web and desktop applications, and mobile webpages. We do not support iOS or Android mobile apps yet. Front Chat is included on the Pro and Plus plans. Read more about how Front Chat works here. Go into your Settings, select Inboxes, and Add a team inbox. Give your Inbox a name, and click Next. Give your teammates access to the new team inbox, and click Create inbox. Complete your inbox settings. Here, you can change the color of the widget, add your logo, and edit your welcome message! Click Save. You will need to install Front Chat on your website or in your app in order to start receiving messages. Grab the code snippet by clicking into the Channel you just created, and copying the code displayed in the Code Snippet section, and insert it before the '</body>' tag on your webpage. 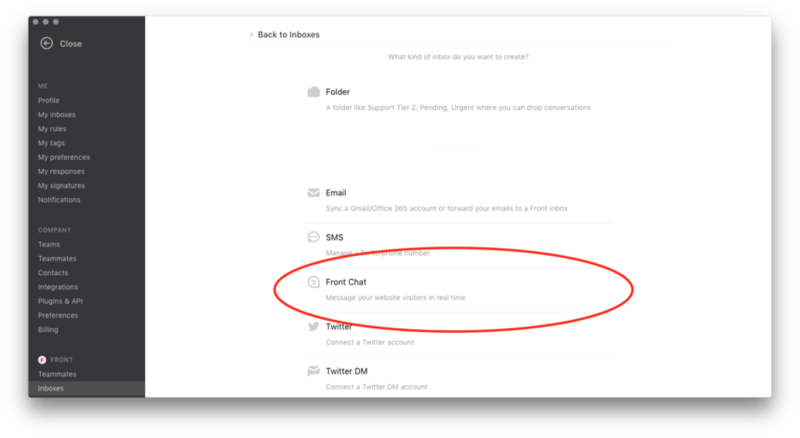 You will need to do this before messages will start syncing from your webpages with your Chat inbox in Front. Your Chat inbox is now live. Start chatting with your customers! If you are using Front Chat in a web or desktop application and need to identify logged in users, after adding the code snippet above you will need to complete an additional step. Copy your Verification Secret from your channel settings. You can use this to pass information to the Chat widget securely from your site or app to the chat widget using the Front Chat API. 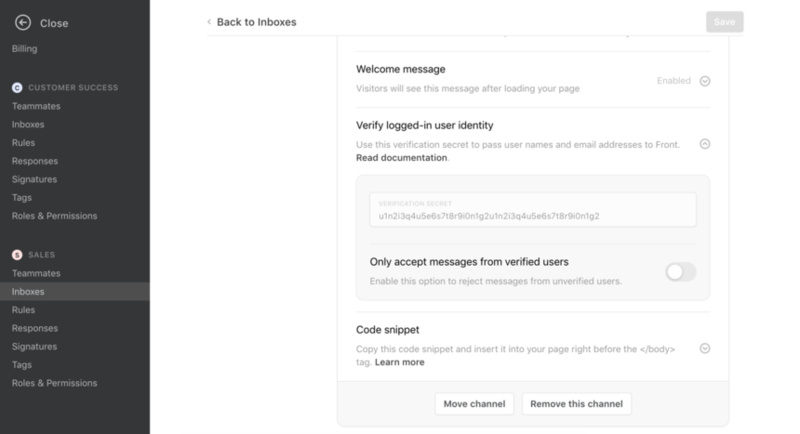 To reject messages from users not logged in to your site or app, turn on the “Only accept messages from logged in users” toggle in your channel settings. If you want to accept messages from anonymous visitors browsing your site, do not enable this toggle. How do I move the chat icon to the left side of my website?